These extension cables can be used for connecting sensors such as our M12 Style Sanitary Sensors, PR-21 and PR-22 Industrial RTD Sensors or other sensors, to transmitters or instruments such as Omega's DTG-RTD Digital RTD Thermometer, TX94A-SS 4 to 20mA Transmitter, UWRTD-S-2 or UWRTD-2-NEMA Wireless Transmitters or other products which include an M12, 4-pin connector (see related product links below). 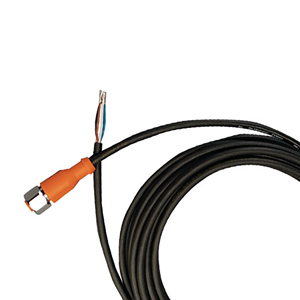 These M12 extension and patch cables are available in a variety of lengths. Special length patch cables with connectors both ends can be custom assemblied by cutting a single ended cable to your required length and then adding one of our field mountable connectors shown in the table below. * = Ambient temperature shown is for the cable, molded connectors are rated to 90°C Max. "PVC" and "PUR" molded connectors are Orange, "SIL" molded connectors are Gray.